As you probably know, escape rooms are becoming a popular teaching technique for the classroom, with many students getting highly involved and motivated and having lots of fun learning and reinforcing concepts. The main problem with escape rooms are their physical nature and problems of set up and control – lots of puzzle pieces and locks that may go missing – not good! The solution is simple – use a non-physical escape room – make it a digital one. No set up and always good to go. That’s what I have built for you to use – an escape build around consumer behavior (CB) introductory topics. The escape room consists of 12 different challenges and is built around the theme of a job interview. Each challenge is in sequence and needs to be solved first before the next challenge is released. Ideally, this CB escape room should be played in small teams, all working off a central computer and with access to a marketing textbook. I have based the challenges around the standard Kotler Principles of Marketing textbook (of which there are many variants). Depending on the skills and experience of your cohort, this challenge will run 1 to 2 hours. 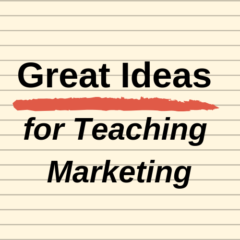 Ideally it is for university-level marketing students – but check it out yourself to see if it is suitable for your classes. If you use it in your class, please let me know how it went as I plan to build some more marketing escape rooms. And please email me – [email protected] – if you are an instructor and need some of the answers.